This is a blended learning class which combines online learning with on-site skills sessions where participants will practice skills and demonstrate competency. Please plan to complete the initial online lessons of your training at least two days prior to your first on-site skills session. Provides participants with the knowledge and skills needed to prevent, recognize, and respond to aquatic emergencies, as well as provide care for breathing and cardiac emergencies, injuries and sudden illnesses until EMS personnel take over. The course content and activities prepare participants to respond quickly and effectively in order to prevent drowning and injuries. This course will reflect the new 2017 American Red Cross updated course materials. Participants must be age 15 by completion of the course. Swim 300 yards continuously using front crawl and breaststroke demonstrating breath control and rhythmic breathing. Starting in the water, swim 20 yards using front crawl or breaststroke with face out of the water, surface dive 7 to 10 feet, retrieve a 10-pound object, return to the surface, swim (using only legs) 20 yards back to the starting point while holding the object with both hands and exiting the water without using a ladder or steps, within 1 minute, 40 seconds. Tread water for 2 minutes using legs only. Score an 80 percent or higher on the final written exams. 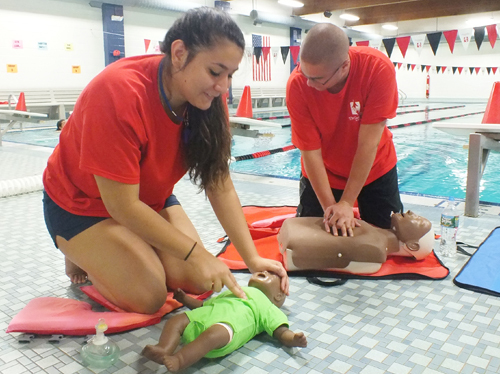 Certification: An American Red Cross certificate for Lifeguard Training/First Aid (valid for 2 years) and an American Red Cross certificate for CPR/AED (valid for 1 year). A membership to The Connection is not required. Pocket mask (can be purchased before testing at The Connection for $20). All online materials prior to each class and attendance of all class sessions. Successfully complete three final skill scenarios, and score an 80 percent or higher on the final written exams. This Community Course teaches students to recognize and care for a variety of first aid emergencies and how to respond to breathing and cardiac emergencies to help victims of any age. Attendance of all class sessions.